This page contains general information about Chip Cards and how the technology will keep your card information secure. If your particular question or concern is not addressed here, please contact the bank at 618-965-3441. A: Chip cards make use of microchip technology, which adds a new layer of security to your card transactions. Each card has a small, square embedded computer chip making your in-person debit card transactions safer from criminal hacking and data theft. The biggest benefit of switching to chip cards is the reduction in card fraud resulting from counterfeit, lost and stolen cards. A: With chip technology, each transaction is approved using a unique encrypted authentication code making it far more difficult for unauthorized users to copy or access your card information. Q: Where can I use my new chip card? A: You can use your chip card anywhere that accepts debit or credit cards. You won’t see many changes in how you make everyday purchases. 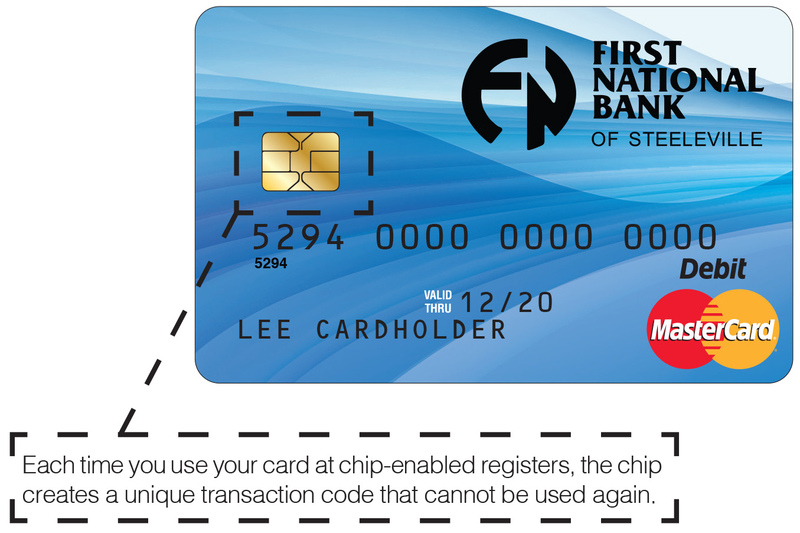 Your new chip card will include both the computer chip and the magnetic stripe. With magnetic strip technology, a quick swipe is used to read the data. With chip cards, the chip is “read” when the card is inserted into the terminal.